Save Tons of Time And Effort, Stay Informed And Up-To-Date On All The Important Internet Marketing News! Never Miss Time-Sensitive News, Critical Information, Important Announcements, Free Gifts Downloads, Special Offers, Valuable Articles, Awesome Deals, Important Info-Packed Events (Teleseminars, Seminars, Workshops) Ever Again! Internet Marketing Newswatch - "Know First, Profit Most!" - is officially launched. IMNewswatch is fantastic; I immediately bookmarked the site and dove right into the latest news. I need to keep up with the latest happenings in the Internet marketing industry so this is a perfect one stop shop that will save me a ton of time every day. There are few sites I visit every day, and only one site that is so important that I set my browser's home page so I see it multiple times throughout the day; IMNewswatch. Every serious internet marketer needs to keep a pulse on what is happening in our industry. IMNewswatch provides an exciting, unbiased view of exactly what is important NOW. Just wanted to say that you guys have created an awesome resource with this site. I just emailed my lists with the following message (message opens in new window). Keep up the great work! What Is Internet Marketing Newswatch? Internet Marketing Newswatch, a.k.a. IMNewswatch aims to offer comprehensive news coverage of the Internet Marketing world on both macro and micro levels. IMNewswatch covers (1) news in important Internet Marketing newsletters/ezines and (2) online news/publications websites. IMNewswatch does all the tedious and time-consuming work of going through the overabundance of information and news covered in these news sources, aggregating it, filtering it, tracing it back to its original sources for verification and direct quoting, and giving you the cream of the cream. In other words, IMNewswatch will keep you informed and up-to-date on all that's going on in the internet marketing world by making relevant news readily available to you on a daily basis, from macro/industry level, down to individuals, products, services and events (micro-level). "Read it first" on IMNewswatch. Internet Marketing Newswatch Is "Powered" By... ? IMNewswatch is "powered" by a hard-n-smart working team made up of professionals in the fields of internet marketing and English/Journalism. In other words, IMNewswatch is "powered" by qualified living, breathing human beings. IMNewswatch is not auto-powered by RSS feeds. There's nothing like IMNewswatch on the entire web, and it's absolutely free. IMNewsWatch is an ingenious and super useful resource, and every marketer should immediately set it as the home page! Make this COMPULSORY - it's the easiest and quickest way to tap into what's hot and happening in Internet Marketing. Excellent idea! I've already bookmarked it - I can see this is definitely a site that I'll be frequenting! 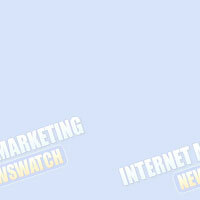 Every Internet marketer should immediately set IMNewswatch as their new homepage. It's great to be able to quickly see what others are up to, spot the new trends, see all of the new products available and even where to gain bonuses and discounts. However even more importantly IMNewswatch is a great place to come and get a free Internet marketing education. It makes it so easy to learn so much just from watching what other marketers do not to mention all of the handy tips that are provided. The Two Primary Objectives of IMNewswatch Are... ? The two primary objectives of IMNewswatch are (1) to save you a lot of time and effort, and (2) keep you up-to-date and informed on all that's going on in the world of internet marketing. Objective #1 - IMNewswatch Saves You A Lot of Time! Let's face it. Your inbox is getting stuffed and filled to the brim with newsletters and ezines that you're no longer reading. Not because you don't want to, but simply because you don't have the time. Maybe you're just opening one or two newsletters that you find most interesting while deleting the rest or leaving them to perish in your mailbox. I know many people, and I'm sure you do too, who just got overwhelmed and ended up unsubscribing from almost all newsletters, one newsletter after another, thereby going back to square one. We definitely wouldn't want that to happen to you. You'd end up missing critical information, time-sensitive news, important announcements, free gifts downloads, special offers, awesome deals, important info-packed events (like teleseminars) and a lot more. There are tons of online news and publication sites. Some are good and many are bad, and even the bad ones occasionally have something that could be beneficial for you. It would literally take you hours and hours every single day, going through a list of links that fill A4 size pages, visiting those sites, reading their news, and filtering out what is important for you. Many of these sites have news taken from other sites, so you would end up reading the same news more than once. Moreover, many of these sites have news taken from the same sources! For example, assume seven news sites and online publications have news about a new Google product. Why should you go through seven websites that cover the same news when you can just check the original source of news; Google? Between the two - email newsletters/ezines and online news sites and publications - you can easily end up spending close to eight hours every single day (including weekends!) trying to cover them all in order not to miss anything that might be important for you. That's a full-time job! Took me no less than 10 seconds before you made it to my default homepage ;) Let me know what I can do to help promote this awesome page...not for money but for the simple reason that it's a great place to keep updated. You guys rock! IMNewswatch is now a website I will check everyday! This is truly the "CNN" of Internet Marketing. Incredible time-saver and highly impressive news coverage. Best of all, it's not bias and it's only purpose is to give real value content. I just hate being just 48 hours behind the crowd... it means losing opportunities and losing money. I want to know everything and I want to know it NOW! BUT as an internet marketer we are so busy, we can't follow everybody and we can't read every email. What can we do? Now there is a quick and easy solution to staying up to date with all of the latest news. Thanks to IMNewswatch, all I have to do is scan through the news posts for the hottest and juiciest action in the IM scene. The time taken to stay in tune with the latest events is just 5 minutes maximum and you can have an advantage over the competition. I am so glad you created this FREE service... I honestly would pay for it if you weren't so generous! Objective #2 - IMNewswatch Keeps You Informed and Up-To-Date! Needless to say, if you could do that - spend eight hours every single day - that would truly be awesome. You'd be 100% up-to-date, benefiting from every opportunity, not missing anything, and staying ahead of the curve. Fact is, you won't be left with enough time to act on all the valuable information you'd have spent so much time working hard to aggregate, filter and learn. A solution for all this is clearly necessary. The great news is: That's exactly what IMNewswatch is all about. IMNewswatch will keep you informed of all important macro-news (industry level) and micro-news (IMers, products, services, etc.). Now you can stay ahead of the curve and stay up-to-date on all that's going on in the internet marketing world by visiting just this one website; IMNewswatch. IMNewswatch is not powered by RSS feeds supplying it with news. Moreover, IMNewswatch tracks news back to its original sources and monitors it. For example, IMNewswatch monitors Google and Yahoo news to get you their latest news directly from them, instead of learning about it from third parties/news site and publications. I have to say that I'm really impressed with your new site. I actually made it my home page and I have not changed that to a different page in about 5 years! Thank you and congratulations on your great new site. I have since last Friday a new Homepage. Every day, I receive approx. 150 emails in my inbox - and immediately delete 80% of them ... With your great service I can check every morning what is new and could be important for me. I'm now making a stop at IM Newswatch first thing when I start my workday to catch up on any news related to internet marketing. Great idea and I love it! my new favorite marketing site. It would have been easier to ask: "What news doesn't IMNewswatch cover?". Here's a partial list of news covered by IMNewswatch. E-business, e-commerce, online marketing, search engines, SEO, email marketing, affiliate marketing, joint venture marketing, viral marketing, resale rights marketing, blogs, RSS, blog/RSS marketing, copywriting, list building, traffic generation, advertising, branding, multimedia (audio, video), research, measurements-n-tracking and many other internet marketing topics. It is very time consuming to follow up and stay up-to-date with their news. IMNewswatch is your one-stop-shop for all their latest news; news about them, their products/services, what they are up to, and a lot more. What is Kelvin Hui, Mr. AdSense I, and Joel Comm, Mr. AdSense II, up to? IMNewswatch will tell you. What is Jim Edwards, Mr. Multimedia and Bob Chambers, the Multimedia Guy, up to? IMNewswatch will tell you. What is Ewen Chia, Mr. Affiliate Marketing and Rosalind Gardner, Ms. Affiliate Marketing, up to? IMNewswatch will tell you. Stay up-to-date with all internet marketing experts! IMNewswatch covers all the news related to internet marketing pros - ordinary people like you making extraordinary money online. Internet Marketing products and services. "What's cookin?" Who's cookin what? What's launching when? What's hot? What's new? New and emerging technologies related to internet marketing. Internet Marketing trends, forecasts, and predictions. Time-sensitive special offers and deals. For example, John Doe launches a $147 product for only $77, with the discount being valid for only 24 hours. "We have an extra special time-limited offer, but it will expire in 24 hours!" Internet marketing events: teleseminars, seminars, workshops, conferences, and so on. IMNewswatch will give you all the details. Important/beneficial Internet Marketing information and articles. Never miss any important information, time-sensitive news or special events ever again. You no longer have to visit many different sites or (forget to) go through tons of newsletters/ezines every single day. IMNewswatch will deliver all the latest news and important, up-to-date information to you on a diamond platter. Be the first to take advantage of and profit from the latest news and benefit from every opportunity. EVERYBODY wants to be on the cutting edge. Internet Marketers depend on that to stay one step ahead of the competition. You've provided the ultimate resource for Internet Marketers to do just that. Needless to say, I'll be visiting IMNewswatch daily. I've spent the past few days reviewing the IMNewswatch Site. It's now bookmarked as a button on my taskbar. Talk about a one-stop information gathering experience - this has already saved me hours in keeping up with the latest internet marketing trends. 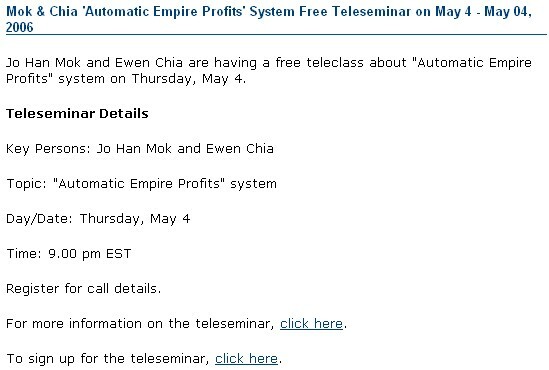 Oh, by the way - I found a great free teleseminar to attend as well. That by itself was worth the visit! I just set IMNewswatch as my home page. IMNewswatch has cut down the time I spend researching the Internet Marketing field. What I like the most about IMNewswatch is that I can quickly and easily scan the news and pick out those items that interest me. I no longer have to worry about missing important Internet marketing news and announcements. IMNewswatch gives me all the news I need quickly so I can spend more of my time growing my business and making money. I've found it's also a great resource for letting the Internet know about my business news, press releases and products. If you want to profit on the Internet with the least effort then make IMNewswatch your home page and get on the fast track. IMNewswatch offers: Breaking News, Latest News I (micro-level internet marketing), Latest News II (Marco-Level Internet Marketing), Quick News, Top Stories, Marketing Tips, among other things. IMNewswatch is also planning to offer audio and video news too. the best thing about all this is that you'll find all the above on one website: Internet Marketing Newswatch. Tip: Learn So Much About Internet Marketing Just By Doing... THIS! You know something? You could learn so much from IMNewswatch just by reading the news headlines! I just got a chance to thoroughly review imnewswatch.com and I have to tell you, what a truly brilliant idea! Not only that, but you've found a way to effortlessly tap into a huge market of, well, Internet marketers. All I can say to you about this project is, BINGO!!! Great job with IM Newswatch! IMNewswatch.com provides my firm with the accurate, no-nonsense information that we are looking for regarding Webmaster related issues and topics. No other company does it better. Mike, once again you have outdone yourself! Great job and I wish you the best in your continued success! Time is our most precious possession, and your site will help people interested in Internet marketing save time and money too. Now that's a win-win! On behalf of all people online let me say a big thank you for the time and effort you have made here. Your site truly serves the people, which means it can't help but succeed both now and over the long run. Congratulations again on IM Newswatch. When you're in a hurry: Just glance through the news headlines in the left-side column. If you have more time to spare: Click on "More" link, next to any news headline and read its Extended Entry. This is ONE outstanding idea and it is definitely needed in the internet marketing world. I know, without a shadow of a doubt, that this will be the main central hub of information for anyone interested in internet marketing. The way you have everything setup on the website is incredible! WOW! I finally can keep up with almost all the IM news from one simple, well-organized location. It will literally save me hundreds, if not thousands of hours of time per year. Now, I'll have even more time to market my business. IMNewswatch is a fantastic idea, what a time saver! When can I tell my friends and subscribers about it because I know they're going to love it as much as I do. entrepreneur's life is hectic and at times the hours long - IMNewswatch is going to help correct that! No more countless hours surfing my favorite sites and reading hundreds of emails daily just to stay on the pulse of the web - I'll get it all in one place now! And I know my budding entrepreneur list is going to feel the same way. This site will get them out of their inbox and onto what really counts in this business...action! What Other Interesting Things Can You Find On IMNewswatch? What do great internet marketers look like? You might be interested to know what Jim Edwards, Joel Comm, Mike Filsaime and Joe Vitale look like. Finally, a central news hub has been created for the growing home-based Internet Marketing industry. I'm extremely impressed with IMNewsWatch.com and have already made it my home page. It gets my 5-Star recommendation (which doesn't come easy!) and I'll be recommending it to all my subscribers. Seems like it could be a real good clearing house and first-stop for a lot of people. Nice job!" Apparently, You have one HELL of a following. Since the news release thing morning I already have 86 signups! I like what you did with the release. and it obviously worked. Thanks my friend, you can bet I'll sing your praises to the rooftops! Update: BTW, I'm now up over a hundred signups and climbing so feel free to change the numbers in my last email. I have seen people try to do this before and it was never as dynamic with a long term vision. This is how I will start my day. I have added your site as my new homepage. "THAT" says a lot right there. Any marketer with news worthy information needs to get in contact with you. Your PR and search rankings will be thru the roof, and that is a big advantage for anyone with evergreen or news worthy information. IMNewswatch Is YOUR News Site! SUBMIT Your Latest News, Press Release, Content (Articles, Audio, Video) And... Your Coolest Picture! If you're an internet marketer, we'd like you to consider IMNewswatch your news website. Submit your latest news, PR, content (articles, audio, video) and picture (for the image gallery). IMNewswatch will work with you to make sure that your news posts are beneficial to you and to the reader. If you're an internet marketing pro/guru and you don't find your picture in the gallery, or you have a better one, submit it to us. Internet marketers are invited to submit their latest and hottest news for publishing on IMNewswatch. Internet marketers are invited to submit their press releases. You can use IMNewswatch built-in press release creator or copy and paste your ready-made PR. Internet marketers are invited to submit their latest marketing tips, articles, (links to) audio and video content. I must say that you're definitely on a winner with your site. It is pure marketing genius. Wow! This is exactly what I've been wishing existed for years now. I run a software development business, and even being "in the industry", I still struggle to keep up with all the new products being released. A resource like IM Newswatch could easily top the best resource of 2006. Easy to read summaries, and straight to the point info for the topics I'm interested in. All I can say is that this is fantastic! IMNewswatch is well worth bookmarking if you want to keep your finger on the pulse! IMNewswatch attempts to cover news fairly, honestly and impartially. IMNewswatch news posts are basic and straight to-the-point. IMNewswatch team does not inject its opinion into the posts. It states the news as is, leaving it up to you to make your own analysis, and come up with your own conclusions. IMNewswatch cuts through the hype. you will not find hype words and descriptions in IMNewswatch news posts. No "the awesome, amazing, super-duper, fantastic ..."
If John Doe says: "I have launched a new product. It is amazing because..."
IMNewswatch news post will read: "John Doe has launched a new product. John Doe claims (or says) his new product is amazing because..."
As you can see, we leave it up to you to judge whether what he's saying is true or not. No product/service recommendations; no "we highly recommend". No hype. Just straight, to the point news you can learn and benefit from. IMNewswatch aims at making its news post a win-win for internet marketers and readers. IMNewswatch news is not auto-powered by RSS feeds. IMNewswatch does its best to go back to original news sources. Mike, this is one of the freshest sites I've seen in a LONG time. Many times I get emails from people asking how I became so successful so fast. My answer is always simple. I kept up to date with everything that was going on with other successful marketers and modeled myself after them. It was hard to do that thought because I had hundreds of emails everyday coming into my inbox that I had to keep up with. 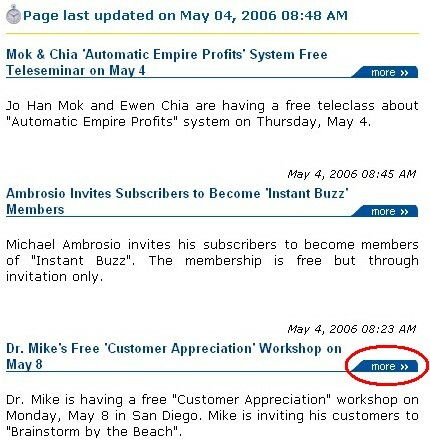 When Mike told me about IMNewsWatch.com I wish I had known about it when I first started. It would have saved me so much time. Now everyone can quickly and easily keep up to date with everything that's going on in Internet marketing. This is how you become successful in this business... By not getting left behind! I've set the site as my start page, and I'm going to tell all my clients to do the exact same thing! IMNewswatch is going to grow stronger with every passing month, week and day. Better coverage, more news sources, and a lot of cool stuff. You'll "hear it first" on IMNewswatch. "Know First - Profit Most!" I've got this bookmarked onto my favorites and plan on putting this feeder on my network of sites. Recent up to date information is crucial in any business but no where is this so true than in the online business world. This is an awesome service that will help many people save time getting the latest information. Thanks for providing an excellent service! I've just been reading your new site again. Its fantastic. You can count me in as another person to add it as my home page. used by leading online marketers is serious business for any serious online marketer. Before IMNewswatch, keeping up to date was very very time consuming. Now with one stop, I can stay current quickly and easily and stay focus on things that make me money vs. getting bogged down in newsletters etc. How Much Is IMNewswatch Membership? Let's say IMNewswatch helps you save at least 6 hours every day, seven days a week. If your hour is only $5, that's around $900 in savings. Therefore, you should expect IMNewswatch to charge you $495 per month and you'd still be a winner. Truth is, this is not something affordable for many people, but $67 per month definitely is, especially for internet marketers who are serious about making a lot of money online. IMNewsWatch gets the TURBO Seal of Quality for sure and time will prove I am 100% right on this - because everybody needs what it is offered here. You can bet that I'll make the best use of it. Because I feel this is MY "IMNewsWatch" - a place where I can stay informed and move on. I'm usually pretty wary of what ends up as my homepage, but you've definitely made it! I'll just visit IMNewsWatch, the perfect one-stop news portal for everything Internet marketing. Great work! concise digest of latest cutting edge movements in the online business world. powerful service provides one more advantage in my arsenal of research tools. P.S. Make sure you set IMNewswatch as your home page or you bookmark it. P.P.S. If you're an internet marketer, send us your picture for the gallery and your latest news. This site will no doubt become a well used tool and resource, for one wanting to quickly and easily keep on top of all things Internet Marketing related via one central webpage. immediately and visit it often... as I know I will be. This is without doubt one of the greatest inventions in Internet Marketing history. This is sure to revolutionize the Internet Marketing World. I immediately bookmarked the page and have it running constantly throughout the day, checking the latest news and product launches (you'll never know what gems you're going to miss). Mike, I have known you for a few years now. I am always amazed with the creative ideas that you come up with to assist other Internet marketers. Your latest web site, Internet Marketing Newswatch is definitely the best that I am proud to recommend to others. Anyone serious about keeping up to date with Internet marketing news and developments should book mark your site and refer to it regularly.